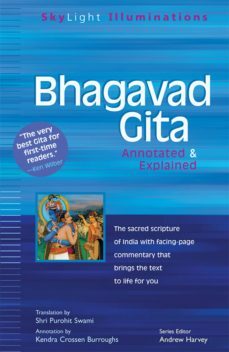 An ancient classic that can become a companion for your own spiritual journey.Millions of people turn daily to Indias most beloved holy book, the Bhagavad Gita ("Song of the Lord"), to instruct their spiritual practice. A Hindu classic, it has universal appeal for people of all faith traditions who turn to its inspirational support in the struggles of life, its consolation in times of grief, and its deeply moving promise of Gods love and guidance.Composed in Sanskrit verse thousands of years ago, this timeless text tells the story of a distraught warrior on the verge of battle and the compassionate counsel he receives from Krishna—God in human form. In just seven hundred lines, the Gita presents concise teachings on such topics as the immortality of the soul, meditation and yoga, worship and sacrifice, the ideal of selfless action, and the oneness of all life in the Divine.Now you can read and understand the Gita with no previous knowledge of Hinduism required.This SkyLight Illuminations edition offers insightful yet unobtrusive commentary that explains references and philosophical terms; shares the inspiring interpretations of famous spiritual teachers; and addresses questions such as the inner meaning of Indias caste system and why this sublime discourse on inner peace is set against the background of a violent civil war.